I would see them about once every three weeks; not that they only came in every three weeks, but my Pastor on Duty assignment and their periodic visits would only seem to coincide about once every twenty-one days. The stories, though told by many different faces—men, women, black, white, young, old—were remarkably similar: they could not find work and needed money to pay rent; they needed gas money for their next job interview; their vehicle required specific mechanical attention; or they simply desired money for groceries. Our church’s policy, obviously devised by men who were less prone to naivety than I was, stated that we were unable to provide financial assistance to those who did not have a relationship with our church. The steps required to establish such a relationship were not rigorous: just come to church on Sundays and after two Sundays, you could meet with a pastor and probably, in most cases, start to receive some financial help. When I first started to meet with these people, I was ready to open my own pockets to them. We were told that we could give out our own money if we wanted to, but we were also advised that this was probably not a good idea in most situations. Casting such counsel aside—in (self)righteous indignation, of course—as a veiled excuse for not helping the poor, I started to give money away to the first few people with whom I met. Soon, however, after some broken promises, (“I will pay you back in a week”) and some reflection on what at the time seemed like legitimate stories, I decided to quit giving out my own money. I figured I was being scammed. Or maybe I wasn’t. 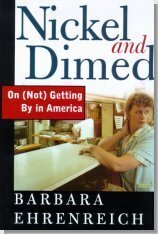 At least Barbara Ehrenreich’s Nickel and Dimed has me second-guessing. To be honest, Ehrenreich has probably only perpetuated a flip-floppiness that began shortly after I became a Christian: do we help the poor by giving them money, or not? The annoying thing about Ehrenreich’s book is that it attempts to dislodge the treasured adage from an upper middle-class mind: hard work always pays off. In the cases that Ehrenreich presented, hard work did not always pay off; in fact, if barely paid the rent. And in my role as the pastor on duty, my initial reactions to most of the people who came through the church door looking for money (for the men, especially) was “Get a job”; and don’t tell me you have been looking—if you really wanted to work, you would take any job you could find. Apparently, I am one of those Americans who is “used to thinking of poverty as a consequence of unemployment” (219). But as Enrenreich vividly illustrates, it is not that simple: even many of those who work—and work hard—find themselves not earning enough to make ends meet. It would seem that the solution for someone in dire financial straights would simply be more hours. Since $7 an hour barely cuts it on a forty-hour workweek, then work sixty hours, or more. But as Enrenreich learned from her experience in the low-wage work force, more hours means, in many cases, no day off—work is done on all seven days of the week—and this takes a toll that is just as real, but less perceptible (at least at the beginning), as the low-wage itself. The undeniable testimony of Scripture is that God’s people are to provide for the poor. But is our duty fulfilled when hand a five dollar bill to the man standing by the freeway entrance sign, or when we give our extra food from the Cheesecake factory to a beggar, or when we take our excess clothes to the local Goodwill? If we take seriously what Enrenreich has written, then to answer these questions with a self-satisfied “Yes,” would be myopic at best, and self-deceiving at worst. There is more to it. What, then, is the Christian’s responsibility to help and provide for the poor in America? I do not think that a few dollars here and there is going to make significant impact. We need a full blown theological response to poverty that not only takes into account the fact of poverty, but considers the causes of poverty. One thing I noticed as I read Ehrenreich’s book is that she primarily interacted with women. This makes sense since she is a woman. But in her experience in the low-wage work force, she ran into many women who were either working in order to supplement the husband’s income, as the sole income for herself and her mate, or in order to support themselves. The missing piece in each situation was a man who was bound and determined to work hard enough to support his family, or a man altogether. Perhaps our serving the poor begins in an unlikely place, namely, in the Church’s affirmation of marriage and family. The economic benefits of marriage are well documented. Allan Carson and Paul T. Mero, authors of The Natural Family: A Manifesto, write that “the wealth-creating benefits of marriage mark the best way out of poverty,” and marriage is especially advantageous for women, showing that “‘power of marriage to deliver affluence for women is extremely strong.’” Carson and Mero tell of a probability sample of 10,847 women ages fifteen to forty-four conducted by researches from Ohio State and Penn State University demonstrated that “‘marriage matters economically.’” Carson and Mero continue, “compared to never married peers, [the studies show that] ‘ever-married women are substantially less likely to be poor, regardless of race, family, disadvantage, nonmarital birth status, or high school dropout” (153). This means that “marriage…offers a way out of poverty for disadvantaged women.” The numbers bear this out. Married black women are much better off economically than are their single peers. The household net worth of the average married black woman in 1990 was $15,650, compared to just $4,563 for the average unmarried black woman. Carson and Mero also note that, “researchers see marriage fostering affluence by eliminating some of the household expenses that since individuals would incur by making possible ‘a division of labor that maximizes family income’ by ‘enabling the partner with higher earnings [usually the husband] to devote relatively more energy and attention to remunerated work.” (152-153). A “division of labor” implies that the husband and wife have different roles to fulfill. The man, primarily, would be earning the income; the wife, primarily, would be taking care of the home and nurturing her children. This “division of labor” allows the man to dedicate himself to earning more money for his family and thus alleviating poverty in his own home. The Church’s affirmation of not only marriage, but the fulfilling of designed roles within marriage, appears to be an effective tool by which to alleviate poverty. This does not mean, however, that we can shirk our responsibility to give our money and possession away to assuage immediate needs. It would be easy to cultivate a greedy heart while claiming to be concerned about the poor because we are “affirming marriage and family.” No, I think serving the poor means getting into the trenches, providing for their needs, visiting shelters and having genuine compassion—not only the “poor” as a group, but on certain poor people that we know by name. Nevertheless, it cannot stop here; we must do both. While we are giving of our money and possessions to help the poor, we also need to be upholding the glorious institution of marriage within our immediate sphere of influence and within society as a whole. As marriage and the roles within marriage are embraced by society, I believe we will see a decrease in poverty, as the studies that Carson and Mero appear to indicate. Some significant questions still remain, however, and will require more reflection and study. How do we as a church approach the issue of low-wages for women? Granted, we will be affirming marriage in such a way so that less women need to be subjected to low-wage jobs, but what is our responsibility in the meantime? How do we counsel young single women who, although they strongly desire to get married, have not yet and therefore face poverty? How should single women, who desire to remain single for Christ’s sake, seek to support themselves? Should women in general, despite their unmarried state, be dependent on others in some way? It is easy for me to tell a 22-year-old man who has just graduated college that it is time for him to move out of his mom and dad’s house, but I find myself reluctant to instruct a young woman in an identical situation to do the same. It seems, by the very nature of our design as men and women, that women were made to be dependent upon a man (either her dad and her husband). It appears strange, therefore, to encourage women to leave the home (when they are unmarried) in the same way that we would encourage a young man to leave the home. How do we counsel young women in this situation? May the Lord guide our efforts as we seek to serve the poor and think more rigorously about how these things apply to the men and women in our churches.